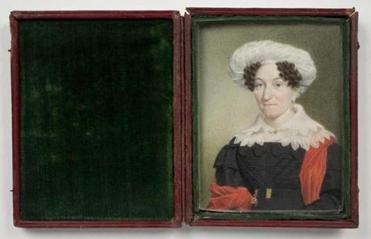 Miniatures of Eleanor Fleming, circa 1824, around the time of her wedding. The miniatures are watercolor on ivory. WORCESTER — Here’s a tiny exhibition: Eleven miniature portraits in a gallery the size of a closet. The gallery is dim until you step inside, when motion sensors light up the diminutive paintings, made in watercolor on thin sheets of ivory. They pull you in, almost magnetically; they’re luminous, and so small you have to get close to see the extraordinary detail. Before the advent of photography, many families had miniatures made to commemorate events and remember loved ones. “Bostonians in Miniature: Portraits and Lives: 1810-1835” at the Worcester Art Museum offers up a handful of these small jewels, and the stories behind them. The show, organized by sociologist David Hummon, is one part art, one part social history. It includes an 1828 map of the Boston, with the home addresses of the subjects of the portraits marked. The group ranges from William and Eleanor Fleming, an Irish tailor and his bride, to Otis Norcross, an importer, his wife, Mary, and their son, Otis Jr., who went on to become mayor in 1867. Henry Williams, who made a living as a portrait painter and printmaker, painted Otis and Mary around 1810, the year after they married. How young and untried they look, despite their finery. Otis gazes sternly at the viewer, adopting a commanding mien under a shock of hair that stands on end. 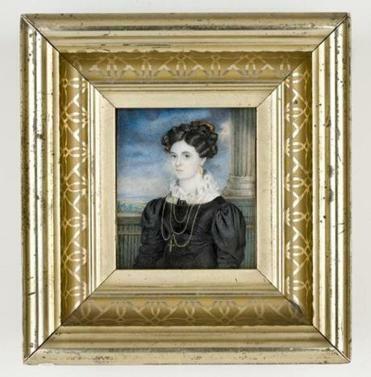 Sarah Goodridge’s portrait of Sarah Salisbury Tappan, from about 1830. Mary is demure. Her brown curls peek out from beneath her white bonnet; she has careful, limpid blue eyes. These are early works by Williams, who went on to create something of a reputation, and they’re hampered by a certain stiffness. Otis Jr., was painted years later as a young man, by an anonymous artist who had keener skill than the young Williams. Where his father appears to be posing as a man of power, Otis Jr. wears that mantle naturally. Whether that reflects the relative character of father and son, their stations in life at the time they were painted, or the talent of the painters, we can only speculate. Portrait of Elizabeth Sewell Salisbury. 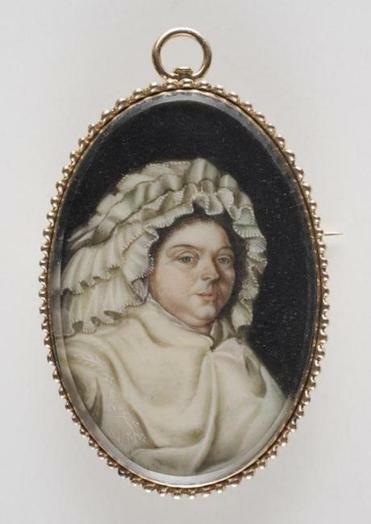 Sarah Goodridge was one of Boston’s premier miniature painters, and she displays a nuanced hand in her portrait of Sarah Salisbury Tappan, the middle-aged wife of a wealthy merchant. Goodridge gives Tappan glowing skin tones. The tiny detail work is almost unfathomable: You can make out the lace on Tappan’s collar. She looks to be a practical woman, thin-lipped, with appraising blue eyes. In his wall text, Hummon reports that Tappan was the mother of 12, and that “she died disconsolate, several days after the death of her 18-year-old daughter.” We don’t have portraits of her children here, but there’s a locket-sized portrait of her mother, Elizabeth Salisbury, who died in 1789, when Tappan was 6. Miniatures for lockets were more common in the late 18th century; in the 19th century, they trended slightly bigger, framed for display on mantelpieces. Salisbury’s face is much rounder, and her nose shorter than her daughter’s. She wears a fantastically ruffled bonnet. The spare details Hummon provides of these women’s lives offer scaffolding for our imaginings: Did Tappan wear her mother’s portrait around her neck? Was that why she had her own portrait painted as she grew older, as a remembrance for her children? Eleanor Fleming wears not a bonnet, but a tortoise shell comb in her magisterial up-do, but how awkward she looks in her gray dress, almost as if it’s too big. The crucifix around her neck attests to her Catholicism. Her groom looks boyish and callow, with his black hair combed forward. The Flemings lived long lives, but they died impoverished and childless. 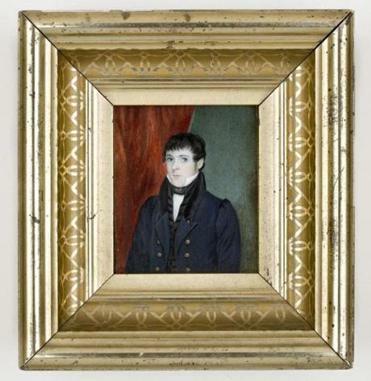 The miniature portrait is an intimate object, whether it’s made to be worn or kept nearby. It demands close inspection. Gazing upon a miniature feels more personal than looking at a traditional portrait, in which subjects can have an off-putting aura of self-importance. The people in these miniatures may or may not have been rich or powerful. These paintings exist because their subjects were beloved. Their execution may be, at times, amateurish, and their value sketchy. But each one is unquestionably precious.